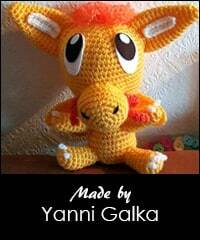 A new fresh pattern: Yellow Dragon! The plush will be about 12 cm tall. This pattern is based on an illustration created by Daieny Schuttz. 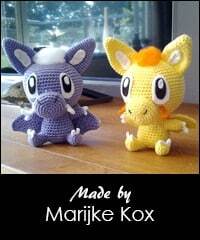 My original plan was to wait with the release of this pattern and make a whole dragon series. I had to drop this plan, because of a new exciting project. I can’t say much about the project for now, but it takes a lot of my time at the moment. This means I will release less patterns in the coming period.